For those who have been to an Episcopal general convention or EYE 2014 (in person or through You Tube broadcast), you have had the experience of hearing the Rt. Rev. Michael Curry preach. When the Bishop gets up to preach, you settle in because he is going to speak for a while – a long while in Episcopal terms. But he is going to come at you with energy and passion. The word this morning is mercy. It runs through our lessons and our hymn selections at the 10 o’clock service. Now I thought that the reading from Genesis, the end of the Joseph story, was about forgiveness, which is different than mercy. But Joseph plays two roles; publically he is a ruler in Egypt and controls who gets food and how much in these years of wide spread famine. Privately, he is the little brother that was sold into slavery by his siblings. Okay, Joseph does have his fun when he accuses them as spies and has them put in prison for a few days. He orders one brother to remain in prison while the others go back to Canaan, with full sacks of grain, and to prove they are not spies, to bring his brother Benjamin back with them to Egypt. As a ruler, Joseph shows mercy to his brothers; as a sibling, he shows forgiveness. What is mercy? What does it mean? Checking the HarperCollins Bible Dictionary, “Mercy is an attribute of both God and the good human being. Hebrew uses several words for “mercy,” of which the most frequent is hesed, which mean loving-kindness, mercy, love, loyalty, and faithfulness. Another Hebrew word and the Greek word for mercy in the New Testament refer to the emotion aroused by contact with undeserved suffering, that is, compassion and a deeply felt love for a fellow human being…grace is also another word used to mean mercy…Divine and human mercy are closely associated with justice and righteousness because all refer to behavior appropriate to a relationship…Jesus shows mercy to the needy…” Mercy is an attribute, showing compassion for someone suffering undeservedly. Joseph as a ruler is providing grain to all the people who are suffering the famine, even those who are not from Egypt, because the whole area will suffer from the seven year famine. Joseph recognizes that God has turned their actions – selling their brother into slavery – as a way to save the famiy; “God sent me before you to preserve for you a remnant on earth, and to keep alive for you many survivors.” In Egypt the Israelites will have a place to live and work and multiply; without it Israel’s (Jacob’s) family would perish. Mercy, compassion for the underserved suffering. The Gospel for this morning has an interesting and uncharacteristic story of Jesus encountering someone asking for help and his ignoring them. We left out reading the optional story this morning of the encounter with the Pharisees where they challenge Jesus about dietary laws. He tells the disciples that it is not what goes into a person that defiles them, but it is what comes out of a person’s mouth via their heart that defiles them. Some time passes as they walk 25 or 30 miles over the next couple days. Jesus must be contemplating the recent events. A Canaanite woman comes to their group and shouts for help and mercy. Jesus ignores her. Then the disciples ask him to send her away; they too assume that he will help her and send her on her way. But he tells them that he was only sent to help the house of Israel, but he has healed outcasts and Gentiles before. His refusal to help her, even when she comes and kneels before him begging for help, isn’t what we expect. Jesus dismisses her with “it’s not fair to take the children’s food and throw it to the dogs.” The woman replies, “even the dogs eat the crumbs that fall from their masters’ table”. You can almost see his face break into a little smile as he tells her that her request is granted. The woman notices that Jesus used the word, not for stray dogs that wander the streets, but for household pets. Pets are not outsiders but insiders. The pets do get to lie under the table and eat scraps that fall or are tossed to them. This foreign woman asked Jesus for mercy, the same mercy Jesus had asked the Pharisees to show. We can have fun speculating on why Jesus acted the way he did with this woman. Has he decided that he must give all his time and energy to his own people? That he needs to really concentrate on helping the religious leaders to ‘see’ what God originally planned for Israel and how they may have erred? Is it the human behavior of frustration and tired of dealing with those who just don’t get it? Did he know that her faith was strong and that this would be a good learning exercise for his disciples and for us? Yes, for us. Because we are challenged daily to be merciful. At times, showing mercy to someone we love is not the same as being nice. The phrase ‘tough love’ comes to mind. When our behavior is enabling or co-dependent, we are not being compassionate to one we care about. We are not showing mercy and love because it is not a behavior appropriate to our relationship. It is hard to change. We, like Jesus in the gospel, are challenged to be merciful with the stranger. One afternoon, a man pulled into the office parking lot in an old car and he looked – well – scruffy. My first thought was ‘What now?’ But as he came to the door, I smiled and said hello. He needed help with an address – that’s all. He was looking for 1032 Lincoln at which point I knew he was probably looking for Lincoln Street. But it began a very short conversation and my attitude was changed; he was not a stranger, he was a father looking for a son who was dying…so he could say good-bye. Lord, grant me the grace to get past the ‘what now’ and be open to hearing the request for mercy. Let your wisdom guide my responses, and may I strive to be merciful in my encounters. AMEN. 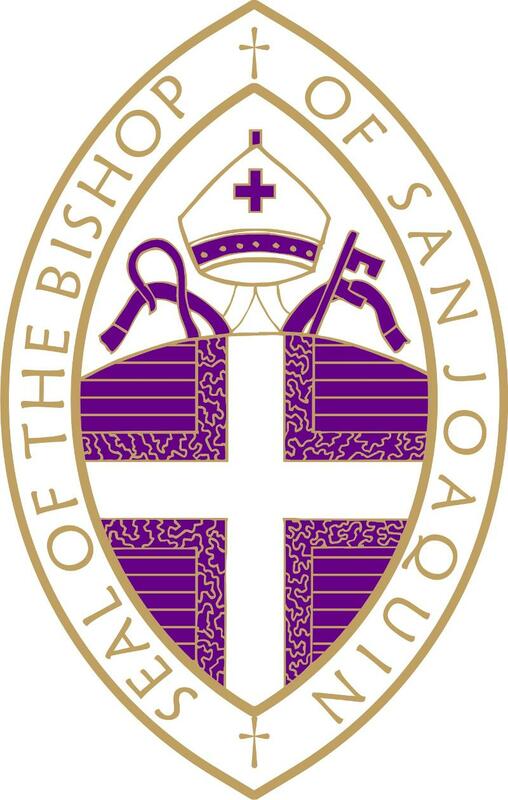 Shortly after St. John the Evangelist was turned back over to the Episcopal Diocese, we had a deanery meeting in the Guild Hall to consider how the deanery could support the returned buildings and downtown mission of the church in Stockton. There were lots of ideas presented from the 40 plus people attending. A second meeting several weeks later also had more than 40 people. Many of these ideas required human capital that the congregation (what little of it that was there) was unable to currently provide. What we did have was an appointed priest-in-charge, an appointed non-stipendiary deacon and a four member board of directors. Lea Isetti, formerly with the Chamber of Commerce in Stockton, was one of those members. She had contacts in the downtown area with business, civic leaders, and non-profits. Her suggestion (following Bishop David’s emphasis on missional thinking) was to ask those she knew to find out what they were currently doing, what they would do if they had additional resources, and how St. John’s might fit in with these needs. We had expansive space (more than 20,000 square feet) and a parking lot, all centered in downtown. We had endowments and rental income that paid the building expenses and maintenance. We had a 3000 square foot Guild Hall and commercial kitchen, and a 2000 square foot children’s area in the undercroft. A beautiful church with stunning stain glass. A separate office building of 2600 square feet. And, most importantly, a desire to share what we had by engaging in the downtown community. A Family Justice Center, sponsored by the DA’s office with support from multiple non-profit service groups, to support families in crisis and connected with the legal system. This would be a separate non-profit umbrella organization. We have resources they need, and a location that is conducive to their mission. Head Start evaluated our facilities and would like to use the children’s area for a downtown location. There is no secure bicycle parking in the downtown area, and we could provide that. Lack of security was one of the principal reasons keeping people from commuting on their bicycles to downtown. There are few neutral musical venues in downtown, especially those that are free. 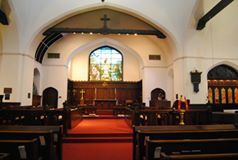 We have a great acoustically pure building with a stunning organ, an especially fine grand piano, and ample seating. We now have some clear guideline from which to formula a missional strategy for St. John’s. It turns out that by filling some of these needs, we will also be generating income to support our facilities. But most importantly, we will be working toward becoming a dynamic downtown presence, engaged in our neighborhood, and meeting people where they are. All of this honors Christ and the Kingdom. As you know we are a diocese in the midst of redevelopment. And this redevelopment is no more evident than the amount of time your bishop and canon spend on the road. Please hear me, this is not a complaint at all, it is simply an observation. Amid this continued redevelopment in a missional context, there is an immediate need for a car. Actually, in due course, we will need two, but one step at-a-time. So we are, as you know, looking for your contributions for an economically efficient, environmentally friendly, reasonably priced, comfortable car. And so, through this continued appeal, we are asking that you give generously. 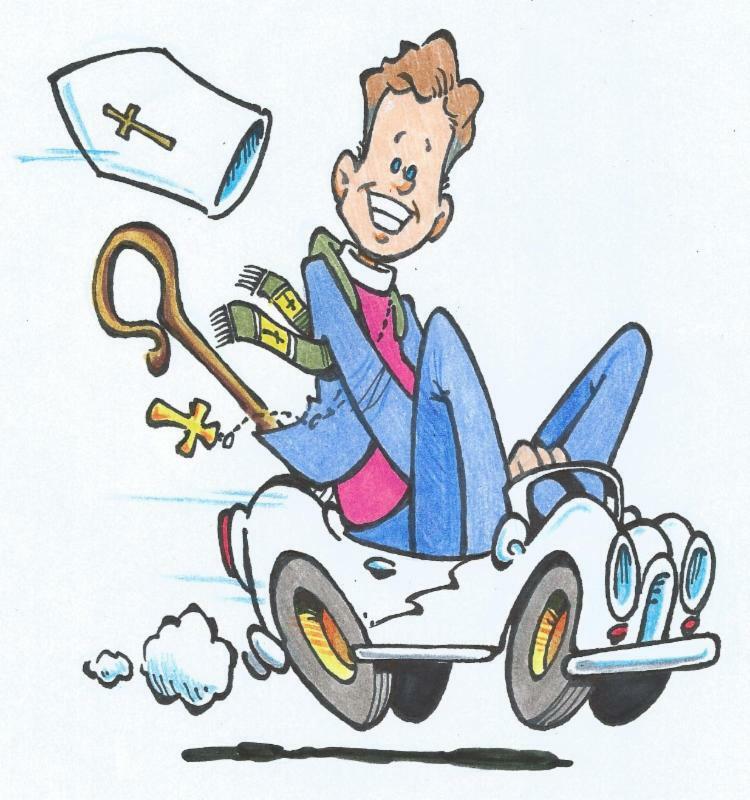 Please help in keeping our “cathedra (seat of the bishop) on the move.” As I said last week in this space, please remember, I hope you give with the knowledge that the Apostolic Ministry we support, the Episcopal Ministry we aid, is non-other than the work which belongs to each of us. I suggest we set as a goal $20,000. I suspect this will not cover the full amount but it certainly gets us much closer. And again, I wish to remind you that these contributions need to be over-and-above that which you gift to our local praying community. The Rev. Kathleen West of St. Paul’s has applied and has been approved by Church Pension Fund for disability retirement. Kathleen’s immediate plans are for her and Ira to stay in the Modesto area, work at healing and getting well, and to come to some diocesan events as well as convention. Please keep Kathleen and St. Paul’s in your prayers during this time of transition. Kathleen’s last day at St. Paul’s will be August 31, 2014 when the congregation will host a thank you celebration. 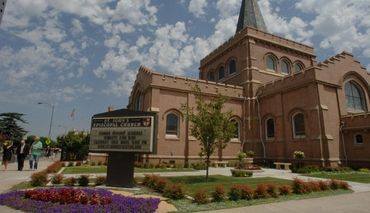 All are welcome to come to the Eucharistic Service at 9:30 a.m. and stay for the thank you celebration at St. Paul’s Episcopal Church, 1528 Oakdale Road, Modesto, CA 95355.
and Missions, Delegates and Alternates. annual convention and to register. For a Marriage Consultation and Consent form contact the Diocesan Office and one will be mailed or emailed to you. Thank you. The Bronze Disaster Preparedness Plan is to be completed by all parishes and missions and turned into the Diocesan Office. Many thanks to St. Clare of Assisi- Avery, St Matthew’s- San Andreas, St. James- Sonora, St. John the Baptist- Lodi, St. Raphael’s- Oakhurst, Holy Trinity- Madera and Church of the Saviour- Hanford, St. Paul’s- Bakersfieldfor completing their plan. 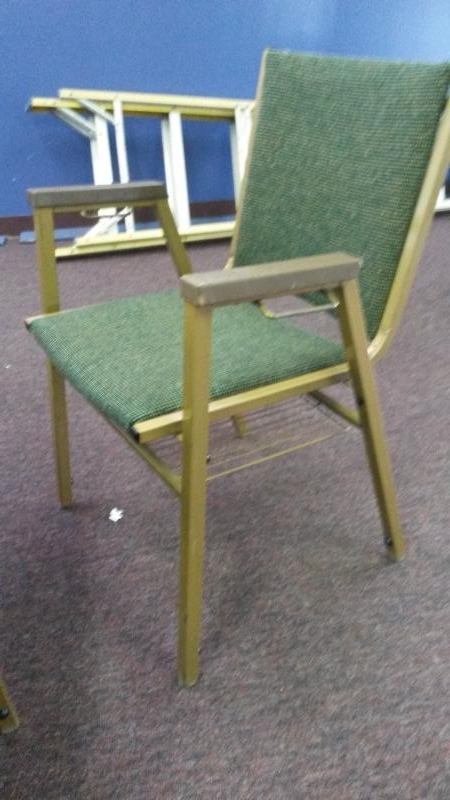 St. Paul’s, Modesto has 207 green upholstered dining chairs for the fantastic price of $10.00 each. Please email Suzie at jeanandsuzie@yahoo.com for more information about the chairs and to make arrangements for purchase and pick-up. are collecting wheelchairs, walkers and crutches to deliver to those in need in Guatemala. They hope to collect 200 wheelchairs. It took a few days to deliver the donations to the group of homeless people because they have to constantly keep moving. They were very happy to receive the items and are doing well. They are still building bicycles and pursuing their dreams.